With as many as 70 percent of electric motor failures related to faulty bearings, the staff at Acme Armature Works Inc. in Sheboygan, Wis. understands the key role bearings play in the process of maintaining reliable motors. Acme Armature Works Inc. owner Chad Bahrs and his staff recently went the extra mile in their commitment to quality bearing service by becoming a Nachi Certified Shop as administered by Nachi America Inc., a worldwide manufacturer of bearings, precision cutting tools, hydraulic equipment, machine tools, robots and high speed steel. To earn the prestigious Nachi Certified Shop distinction, electric motor shops must meet certain standards and practices, which in turn effectively translate into longer operating and more reliable electric motors. Nachi America Inc. training staff members recently visited the Acme Armature Works shop to administer a comprehensive three-hour audit, training and certification session. The audit included a review of Acme’s practices for storing and installing bearings for electric motors. The training session covered Nachi-approved practices for bearing installation, lubrication, handling and failure analysis. Upon completion of the audit and training, each participating Acme staff member received a certificate of completion, while Bahrs was awarded a plaque and decals to display to customers in the Acme shop facility. 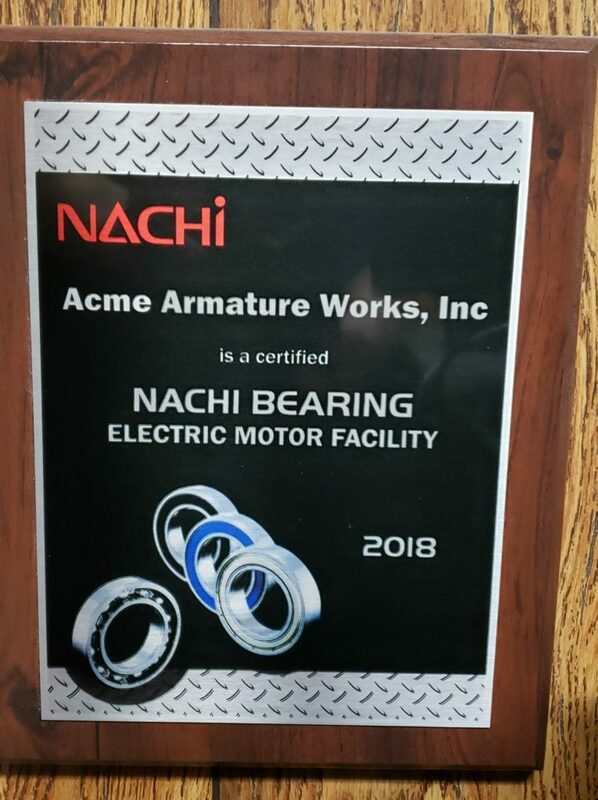 As an added benefit for earning Nachi Certified Shop status, Acme Armature Works has access to Nachi America’s full line of electric motor bearings, lab access for failure analysis and in-field engineering support. Per Nachi Certified Shop standards, Acme Armature Works must now pass an ongoing audit process and maintain all standards for continuous improvement. For more information or to request service with Acme Armature Works Incorporated, email info@acmearmature.com, call the 24-hour service line at 920-452-3389 or visit www.acmearmature.com.